I’m sitting in the plunge pool on the private patio of our quaint cottage at Ottley’s Plantation Inn, a family-owned property overlooking the Atlantic Ocean in the foothills of the rainforest on the sleepy Caribbean island of St. Kitts. Hummingbirds dart and dash amongst the flowers of a noni tree beside me. A trio of white egrets hunts for fish in a lilypad-laden pond 50 yards away. Two lizards do a ritualistic dance, bobbing up and down on the patio railing. And all around me, the calls of doves, frogs and the ubiquitous yellow and black birds known as Bananaquit (made famous by Harry Belafonte, who sang, “Yellow bird/Up high in banana tree…”) fill the air, signaling that the day is winding down to its conclusion in the most peaceful, pastoral way possible. It is something akin to paradise. After five days of hustling to see seemingly every tourist attraction on the island, it’s also a refreshing change of pace. Change is at the heart of the story of St. Kitts, which is more formally known as Saint Christopher and is part of a federation with neighboring island Nevis. Located in the Lesser Antilles about 1,300 miles southeast of Miami, the tiny island (65 square miles, with just 35,000 residents) was built on the back of its sugar trade, which began in 1640 and continued to dominate the local economy for 365 years. But in 2005 the government shut down sugar cane production permanently, citing huge financial losses and increased competition from Europe. These days, St. Kitts is adapting to tourism being its #1 industry, hoping to establish its own distinctive identity in a region full of bigger islands with bigger marketing budgets. We began our journey at the epicenter of the island’s tourism business, Port Zante, where cruise ships arrive almost daily and unload thousands of passengers to explore the capital city of Basseterre. The shopping center surrounding the port is upscale and dotted with tidbits of local culture, including a great traditional folk band, a Carnival-style drum and dance troupe, and pushy vendors who, for $10, will let you pose for a picture with one of the island’s 40,000+ vervet monkeys (brought to the island during slavery days hundreds of years ago, now something of a nuisance). St. Kitts’ history is everywhere you look, from the abandoned sugar cane fields that line the ring road around the island to the centuries-old sugar plantations that have been refurbished or rebuilt to create some of the area’s most intriguing attractions. The National Museum offers an engaging overview, with several simple exhibits tracing the island’s heritage back to the early Arawak and Carib inhabitants, through the years of colonialism and slavery, and up to its official independence from England in 1983. 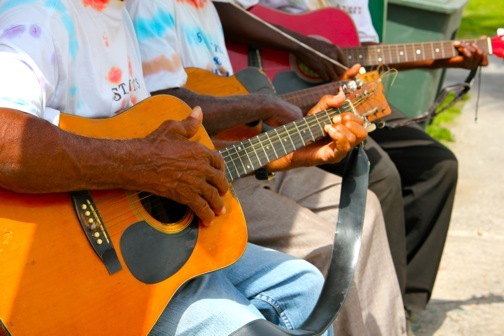 But to get a true taste of St. Kitts, you’ll need to venture a bit further afield. 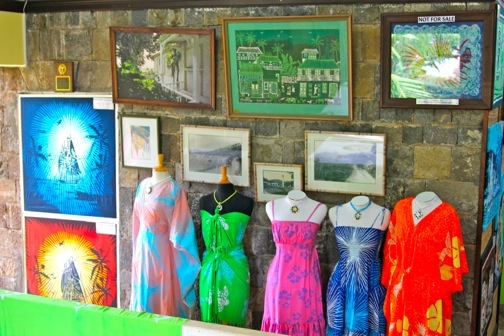 Our second stop, Caribelle Batik, offered an intriguing view of St. Kitts’ past, present and future, all in one place. The batik store has become world renowned for its quality fabrics and intricate designs, using ancient Indonesian methods of wax dye resistance to create colorful masterpieces and offering live demonstrations of their production process. The store sits on the immaculately landscaped grounds of the historic Romney Manor, which was once owned by Thomas Jefferson’s great great great grandfather and may have been home to a Carib Indian village. Right next door is Wingfield Estate, which was also owned by Sam Jefferson and was the first land grant in the West Indies, the first example of British masonry in the new world, and the first rum distillery in St. Kitts. The ongoing archeological digs there are uncovering nearly 400 years of history, making it a photographer’s dream. Meanwhile, their new Sky Safaris zipline offers exceptional views of the surrounding rainforest for adrenaline junkies and nature buffs alike. 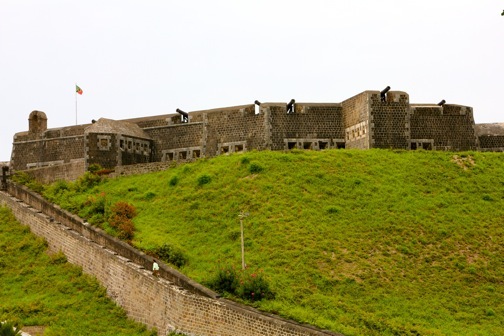 But the piece de resistance of St. Kitts’ historical attractions is Brimstone Hill Fortress National Park, a UNESCO World Heritage Site and the largest fortress ever built in the Eastern Caribbean. Designed by British military engineers, built by African slaves, and situated strategically 800 feet up on a hillside overlooking the ocean (and neighboring islands), the fort was constructed intermittently over the course of 100 years, beginning in 1690. Known as “the Gibraltar of the West Indies,” the fort was completely restored in the 1970s-80s. Now, visitors can spend hours exploring its grounds, including the Citadel, Western and Eastern Place of Arms, Fort George Museum and ruins of the officers’ quarters. There are no guides to walk you through, but there are breathtaking views of the countryside, not to mention vervet monkeys aplenty. 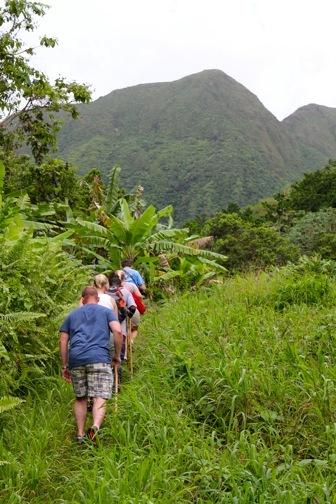 After so much Colonial history, we were delighted to break away from humanity and head for the hills on the Windward Coast Rainforest Hike with Greg’s Safaris. Led by a 5th generation islander, the tour takes you off the beaten path via 4×4 safari vehicle and into the wild, mountainous heart of St. Kitts, which is protected as a national park. It felt like walking onto the set of Lost as we made our way past hilly farmland and into the jungle, spotting hummingbirds, butterflies, crazy tropical flowers (including one that curled its leaves if touched), amazing trees and picturesque waterfalls along the way. It was truly a different world, and the picnic of fresh local fruits at the end provided a wonderful opportunity to cool down and soak in the majesty of the view from 1200 feet. Fortunately for us water-lovers, St. Kitts isn’t all history and wilderness. Bounded on one side by the Atlantic Ocean and the other by the Caribbean Sea, its beaches offer plenty of activities for those seeking a little fun in the sun. Our first hotel, the St. Kitts Marriott Resort, boasts a massive beach lined with approximately 100 shaded cabanas, and a small reef just offshore that provided surprisingly decent snorkeling opportunities. One of our favorite memories was a school of silver fish with black fins that followed me everywhere I went, seemingly attracted to the blue hibiscus on my swim trunks. We also had a great day at Cockleshell Bay’s Reggae Beach Bar, owned by safari Greg’s brother. There, you can rent everything from Hobie cats and kayaks to jet skis and snorkeling gear, exploring a beautiful bay that affords amazing views of Nevis, just two miles away. Or, you could take a tip from our friend Cathy and simply lay on the beach chairs, soaking up some sun while drinking a delicious Kittitian Rum Punch. 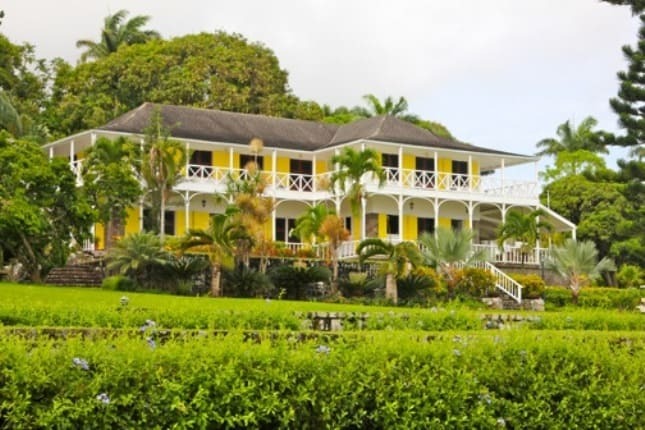 By the end of several busy days of exploring the island, we were delighted to make our way to Ottley’s Plantation Inn, originally built as a sugar plantation in the early 1700s. The current owners, who bought the property in 1988, turned the Great House into a gorgeous two-story inn, adding dozens of delightful cottages that match the colonial-era style and using the remains of the old sugar cane processing plant as the foundation for their open-air restaurant.